Fargo season 2, Episode 4 recap. 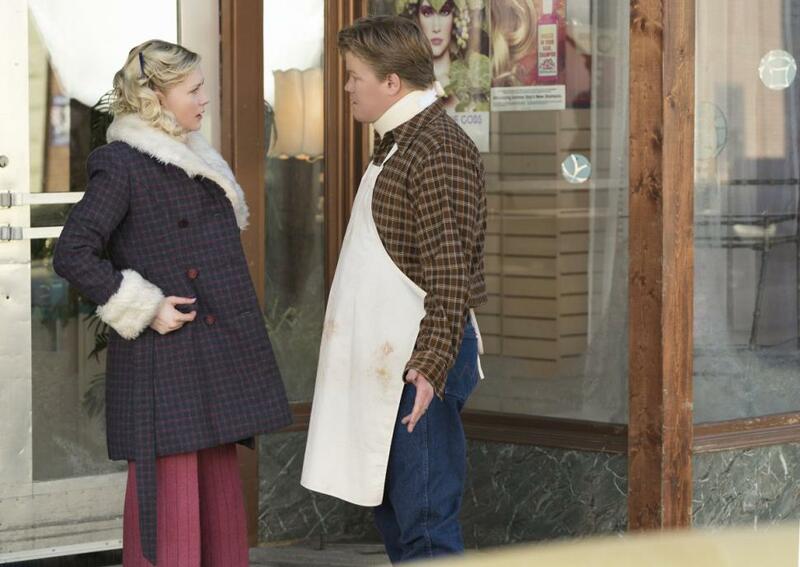 Story time on Fargo resumed this week, with Lou telling Peggy and Ed a story about being a soldier. Specifically, he told them about the look that mortally wounded soldiers get, in the moments before their brain processes the trauma they’ve just suffered. It’s a disturbing story, but it drives home the central theme of Fargo season two, about war and the toll it takes. (It also features an absolutely STELLAR bit of acting from Patrick Wilson, whose unflashy style is so perfectly suited to Fargo it’s a minor tragedy of the art form that he’ll probably only get to do this for the one season.) Lou has been to war, he knows that look when he sees it. This episode is literally about people at war—Joe Bulo rejects Floyd Gerhardt’s offer of partnership and so Floyd declares war on Kansas City, Betsy Solverson is at war with her body as her cancer is spreading, and the various men of Fargo are all at war with something or other. We learn that Hanzee, who is half Native American, who works for the Gerhardts, was also in Vietnam, and he apparently saw some really bad sh*t as a kind of scout for the Army. It’s a little annoying that the Native character is so good at tracking it’s practically magical, but then Noah Hawley turns it around by suggesting that that very assumption—that the Native American is a good tracker—is what landed in Hanzee in the bad stuff to begin with, and really his skills are likely the result of Army training. Hanzee and Lou are both on the trail of Rye Gerhardt, and they both arrive at the same conclusion about Rye’s fate and the Blomquists’ involvement. They both even arrive at the Blomquists’ house at the same time, with Hanzee snooping inside even as Lou waits on the front porch for Ed and Peggy to return home. They’re evenly matched, which is more than can be said of the Gerhardts and Kansas City. Dodd is vicious and unstable—the cold open gives us a glimpse into the childhood that shaped him—but Mike Milligan is ruthless. Where Dodd roughs people up with a cattle prod, Milligan goes for his gun and a more permanent resolution. The Gerhardts are capable, but they lack the pragmatism of Milligan and Kansas City. And pragmatism, as Lou illustrates, is the name of the game. Knowing when you’re licked is half the battle, but the Blomquists don’t know they’re licked. Lou almost gets Ed to crack and confess, but Peggy stops him, and they double-down on their story about hitting a tree instead. Peggy is determined to get her way no matter the cost, even if it’s the consequences of someone finding Rye’s body in the deep freeze, or Ed not being able to buy the butcher shop. Peggy uses their money to finance her trip to the cult-y sounding group, LifeSpring, but that means that Ed can’t buy the butcher shop. Constance encourages Peggy to think of the money as hers, and she makes a good point about women subjugating our desires and wants for men, but Peggy isn’t just pushing down her own goals for Ed’s sake—she is actively ruining his dream, too. They don’t have enough money for her self-actualization stereotype and Ed’s butcher shop, so Peggy takes the money and goes for self-actualization. All other considerations aside, this is not a pragmatic choice. Peggy wants more than the staid, conventional life Ed desires, and she’s sneaking birth control to ensure the kids he wants can’t come along, too—nothing is going to stop her getting what she wants, not Ed, not Lou, and not the body in the deep freeze. But she’s not being pragmatic. She’s like the wounded soldiers in Lou’s story, unaware that she’s injured. Ed didn’t go to Vietnam, so he doesn’t know that he and Peggy are already dead. And worse, they think they can still save themselves.